We are on to E of the A-Z Challenge hosted by Celeste Jones and Spanking Romance Reviews. 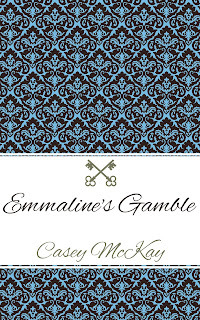 Today I have an excerpt for you from my short novella Emmaline's Gamble. Emmaline first makes an appearance in my book Emmaline's Groom. You can read this shorter one as a standalone, but why would you want to? "Step right up here, little lady," the man running the game said. He was a smarmy fellow with eyes that crinkled at the corners. He leaned in as he gave her a leering smile. A shiver ran down her spine as she made eye contact with him. She hesitated with the hand on the clasp of her bag. "Do you have something to wager? Maybe you should run along and ask your husband." Heat rose to her face and she met the man's eye in challenge. "I do not need to find my husband. I have a wager right here." She pulled one coin from her purse and placed it down in front of the cups. The man's eyes lit up at the sight of the money and gave her a smile. Checking to see if she understood the rules, he placed the marble under the left cup. Emmaline did not even blink as she watched the man mix up the positions of the cups, following the one which had the marble in it. She chose the center cup when his hands came to rest. The man lifted it to reveal the marble beneath it. The crowd gave a whoop of excitement. Pride filled her chest and she eagerly nodded in the affirmative when the man asked if she would like to wager her winnings. Emmaline wagered her original coin, plus the one she won, and added a coin from her purse to the pile. She knew her time was limited, Leo would soon realize she had wandered off, so she wanted to win as much as she could in the short amount of time she had. She knew she was being greedy, but Leo would not fault her if she managed to triple the money she had in her purse. Grace appeared at her side, tugging at the sleeve of her dress and gesturing behind her. Emmaline shook her off, trying to concentrate on the man and where he put the marble. She watched as he again placed it under the right cup. Then Grace was tugging at her dress again. Emmaline swatted her away with one hand as she kept her eyes trained on the man. He seemed to give the cups an extra shuffle before they came to rest, but she knew for certain that the marble was in the left cup. "Emmaline!" Leo's sharp voice drew her attention from behind her. Reluctantly, she turned to see her husband glaring at her. She gave him a little wave before she said, "Just a moment darling, I am almost done." The crowd gave a chuckle and Leo's face darkened at her brush off. She turned back to the man at the game and pointed to the cup on the right. The crowd gave shouts of agreement and she knew she had chosen the correct one. Only when he lifted the cup there was no marble. "What?" Emmaline shouted, her heart thumped in her chest as the man scooped up her pile of coins. The crowd jeered at her loss. A couple of men yelled that the man was cheating. Leo was at her side, pulling her away from the game, "What is the meaning of this?" he hissed in her ear. "Leo, I was winning. It should have been under that cup!" she exclaimed. "Better luck next time, darlin'." The smarmy Confidence Man leered in her direction. Emmaline felt tears burn in the back of her eyes as the crowd dispersed, a few sending comforting words her way as Leo's hand tightened around her forearm. She had lost her entire weekly allowance. Her heart thrummed in her chest as she thought of the best way to admit this to Leo. Grace gave her a quick hug, urging her to come by the house tomorrow, before she retreated to James and they hastily made their way away from the crowd and the angry Leo. "I believe he cheated," Emmaline protested, searching Leo's face for any sign of agreement. He did not respond. He pulled her arm dragging her behind him as he made his way toward the exit of the fair and pointed them toward home. Make sure to check out the other A to Zers!